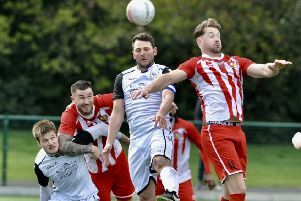 Hastings United Football Club held firm to earn a creditable point at home to top four opposition tonight (Tuesday). Chris Agutter’s side drew 1-1 at home to Cray Wanderers in Bostik Football League Division One South, matching the result in September’s reverse fixture. Both goals came during the first half, with debutant Calum Davies putting Hastings ahead before Michael Power brought Cray level. Hastings made two changes to their starting line-up from the weekend draw at Shoreham. Tom Climpson came in at centre-half and Davies up-front, while Ollie Black dropped to the bench and there was no Sam Adams. Cray came close early on as Brandon Scott’s angled drive was well saved by Hastings goalkeeper Charlie Horlock at his near post and Jay Leader’s free header from the resulting corner hit the post via a nick off another head on its way towards goal. Hastings opened the scoring with a fine goal in the eighth minute. Dayshonne Golding’s low cross from the right was superbly swept into the far corner of the net by fellow new boy Davies. For a while after that Hastings looked bright, energetic and played some good football, with Golding in particular catching the eye. But it fizzled out rather too quickly and much of the rest of the game followed the familiar recent trend of too little possession and too much defending. Cray, who possess the division’s best defensive record this season, equalised with a well-worked goal in the 26th minute. Barney Williams played a neat one-two with Jerome Frederico on the away left before crossing for Power to volley into the bottom corner from just inside the box. The visitors had the ball in the net again 10 minutes later when Mitchell Nelson headed in from Michael Frieter’s corner, but the referee spotted an infringement. A couple of minutes after that, Horlock failed to hold Power’s low shot but recovered well to save the follow-up from Scott, who was flagged offside in any case. Cray dominated the ball during a rather drab second half, but didn’t do enough to break down a Hastings side which hung on in there without playing well. Half-chances were the best either team could muster. Power blasted over from the right-hand side of the area for Cray, while at the other end, Davies got on the end of a good ball by Sam Cruttwell but couldn’t keep his finish down. Another Power effort from the edge of the box was well held by Horlock, who then saved comfortably from Frieter before beating out Scott’s angled strike at his near post. Moments later, Cruttwell was just off target with a nice turn and shot from outside the box. Hastings survived a scare in the 90th minute when Sam Beale, who otherwise enjoyed a decent game, misdirected a defensive header straight to a Cray forward. Three minutes into added time, Davide Rodari flashed a 25-yard shot just over the Cray crossbar. After their second 1-1 draw in four days, Hastings have dropped a place to 18th in the table with 17 points from 16 matches. Hastings: Horlock, Rowe, Beale, Dixon, Whyborne, Climpson, Rodari, Golding (Sotoyinbo 59), Davies (Pogue 76), Janneh (Lovatt 54), Cruttwell. Subs not used: Black, Pritchard. Attendance: 254.